KARACHI: A part of his face may still be scarred but this strapping young 18-year-old man from Quetta has eyes full of dreams, and some of these dreams have begun to come true. Life changed for Ashraf Khan since people from Institute for Development Studies and Practices (IDSP)-Pakistan stumbled upon him. The teenager has learnt lessons beyond his years. By the age of 15, he had already experienced poverty, an acid injury, garbage picking as a profession, and drug addiction as an escape. His handsome features, once ravaged by acid burns, have now begun to emerge again, thanks to the treatment for which IDSP and Indus Hospital have helped him. Ashraf became a garbage picker around the same time he had the accident. With nine siblings and a father too old and sick to work, child labour was inevitable, that too the worst kind as a scavenger of waste. Finding a guiding hand from IDSP, he was brought to Karachi some two and a half years ago when he was operated on at Indus Hospital. “I cannot express how happy I was. My Ammi could not believe it when my brother sent her my picture. I had a face once again.” Ashraf has never been to school and talks in Urdu with difficulty, but has already produced a documentary film on the plight of garbage pickers and it has been well-received. Budding filmmaker Ali Ahmed (left) dreams of one day making a film that will be shown in a cinema, while young Ashraf Khan (right) has overcome poverty, an acid injury and drug addiction to produce a documentary on the plight of garbage pickers. 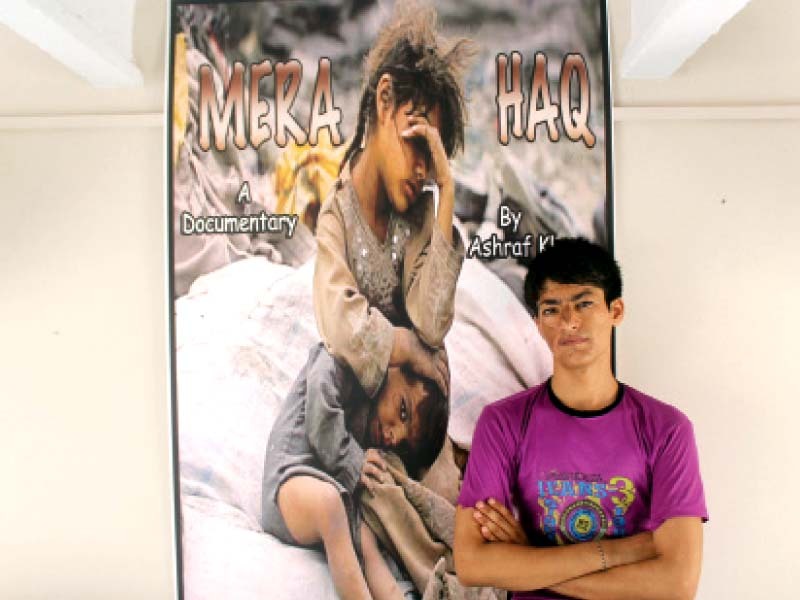 Ashraf is one of the 30 students who exhibited their short films and documentaries at the Pak-American Cultural Center under the IDSP Film Festival, 2015. Sensitive subjects, such as target killing, violence, human rights, living in conflict zones, sectarian violence and social marginalisation were tackled deftly in these films. “All the funding to make these films was provided by IDSP,” said Asma Zafar, IDSP’s institutional support manager, who is a mentor to many young people from Balochistan. Ashraf admitted the idea to make a film came to his heart. “I want more and more people to see it so that people understand what garbage pickers go through,” he said about his production and directorial debut in which he dabbled with a little bit of acting too. His 20-minute-long film, called ‘Dhutuk’ meaning doll in Brahwi, comments on the devastating effects of terrorism on families. “I want to show that when one person dies in an act of terrorism, an entire family dies with him or her.” After coming to IDSP, Ali feels he has found his calling and knows what to work towards. Published in The Express Tribune, June 28th, 2015. Posted in Human Rights and tagged acid burn, Balochistan, IDSP, Indus Hospital, success story. Bookmark the permalink. Journalist, writer, Communications practitioner, teacher, media trainer | Literature | Gender Parity | Peace | Islam | Very Desi | Chaai, not coffee.